The King of Kophen’s bluebird failed to sing for three years. The king heeded her advice. The bluebird saw its own image. It sang of its sadness, it danced, until it expired. After making twenty feature films in thirty-five years, not to mention writing, acting, and producing for other leading filmmakers such as Edward Yang and Zhang Yimou, the celebrated Taiwanese writer-director Hou Hsiao-Hsien turned to two loves of his past — the chuanqi (legends) of China’s Tang Dynasty and the wuxia (martial arts) films from Hong Kong — to create a unique rendition of a favorite story, “Nie Yinniang,” which he would call The Assassin. The irony starts right there. 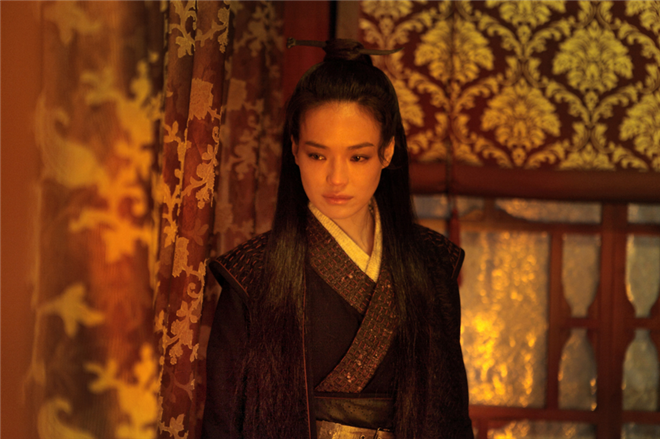 While this humble heroine is highly skilled in swordplay, having been intensely trained by a nun who raised her when she was abducted from her father, a decorated general, her heart “lacks the resolve” to fulfill her assignment and kill her cousin, the governor of Weibo province, when she returns home after thirteen years of exile. He was once her betrothed. But much has changed. Nie Yinniang’s mother tells her of the story of “the broken jade” and the princess who broke with the emperor and took all his gold and gems with her to Weibo province, where she was sent to make peace. Instead she gave the silks and riches to the Weibo people to enable their independence. But when the emperor and his son died, she regretted her actions and coughed up blood. Then all the glorious white peonies she had brought withered overnight in her garden. She threw her pearls and jades to the ground. Her wish was that Nie Yinniang and her son, now Weibo’s governor, restore unity to the empire and preserve the peace between Weibo and the imperial court. That son, Tian J’ian, has one-half of a ring of broken jade; Nie Yinniang has the complementary half. 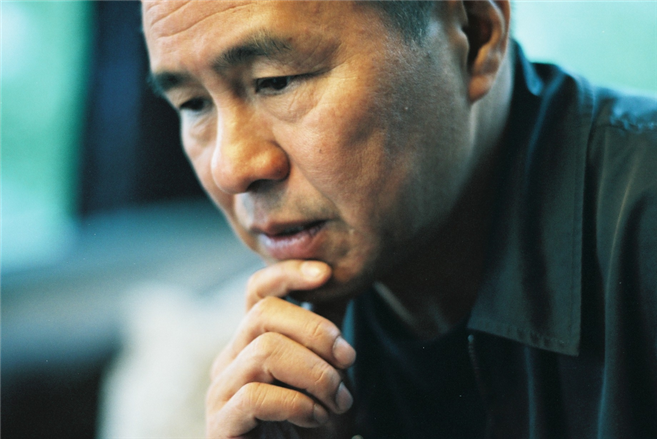 Hou Hsiao-Hsien has spoken of his film as a river in continual flow, flux, and intermittent turmoil. In the Yin-Yang of the world, this means perpetual transformation between a condensed state of life and a diluted state of potential. On the path of recreating her life, Nie Yinniang vacillates between the actions required of her to correct injustices and the inaction that expresses her convictions and feelings, her spontaneous interactions with her newfound observations and perceptions. Upholding autonomy, she ekes out an individual’s way toward a simple life. Live like water, with humility and harmony, free from selfishness, detached from desire. Accomplish by non-action. Taoism. Two countries can see each other, can hear the sound of each other’s chickens and dogs. They eat their own food, wear their own clothes, and live in their own ways. They will not fight with each other. How would Hou Hsiao-Hsien show this philosophy in a wuxia film? Unlike his predecessors’ works in the genre — for example, Zhang Yimou’s Hero from China and Ang Lee’s Crouching Tiger, Hidden Dragon from Taiwan — Hou would eschew the magical leaps and flights that special effects can produce, the martial arts of the CGI-generation, and achieve his chuanqi through realism by employing the tenets of Taoism in the Tang dynasty in his casting, scripting, and shooting of The Assassin. Three dialects of Chinese — Cantonese, Mandarin, Taiwanese — would seem natural for actresses (playing Tian J’ian’s assassin, his wife, and his mistress) who hail from three distinct “Chinas” that co-produced the film; yet the actresses harmonize in scripted dialogue that uses an old, nearly archaic language. Regarding the narrative, Nie Yinniang doesn’t return to her mother-in-law to bolster a central government, and she doesn’t remain in Weibo with the provincial governor, but she retreats to a remote village where she can lead an unpretentious life in peace and harmony with the natural world. Most significantly, this assassin doesn’t kill, though a pre-credit sequence astonishes us with the certainty that she can. Her potential is clear, but so is the fact that in the opening of the story she already refuses an order, to attack a man who has his little boy with him, just as she likewise declines to act as she observes her betrothed with wife, son, and daughter, not to mention his pregnant concubine nearby. 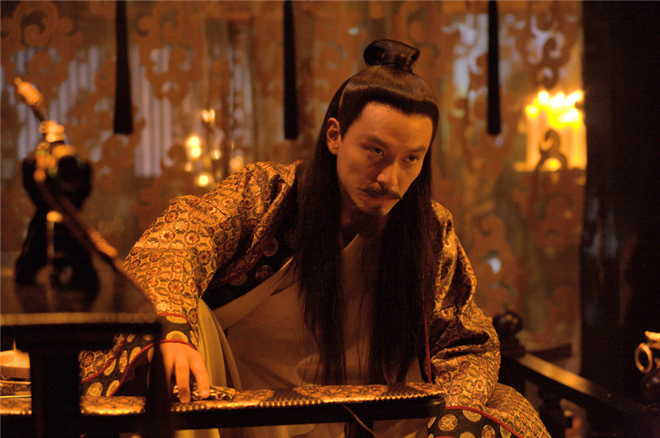 Nie Yinniang is pressured by her mentor to act, but the authority of the hierarchy doesn’t hold. 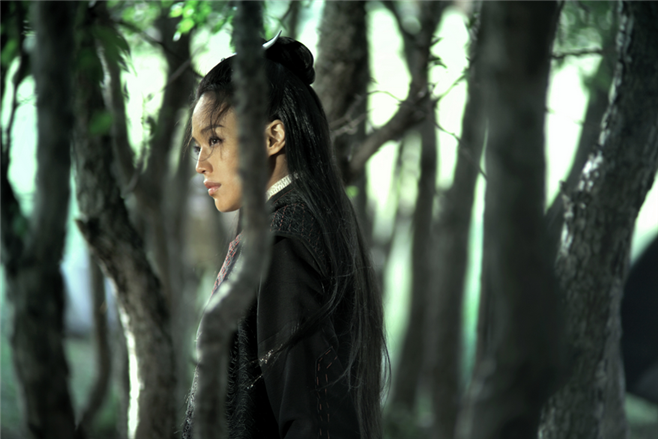 Hou Hsiao-Hsien instills in his assassin a certain magic, but not the kind that uses leaps and bounds. Nie Ninniang belongs to no one. She has no friends, no family, no lovers, no part in the civilized world. Her only haven is nature; her only acts, natural. 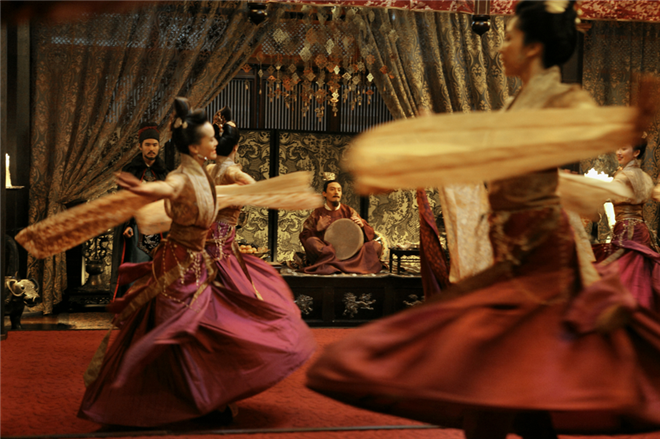 Yet the director creates an aesthetic of magic through distance — a verbal language of “olden times” with the lonely splendor of the gujin plucked and strummed amidst the ladies of the provincial palace in organzas and brocades of rose, peach, and plum. An incredible long shot catches a promenade of maidens under shade umbrellas all the while just past them, behind a grove of trees, floats the sound of an attack, sword play at the hand of a stranger, unseen, unknown. Men fall from the tiled roof and run to the bamboo thicket, unrecognized. At night a slow drum and crickets, and close-by in the candle light, a gauze curtain sways endlessly, gently, filtering the lover’s play behind it, Tian J’ian and his mistress, Nie Yinniang observes. She is our eyes, our ears, as we, too, shift our focal choices to ponder, interpret, meditate upon other lives, other times, of which we are not a part. The moments are spellbinding. Physical remove and temporal suspension hold us in thrall; the distance of space and time position us, spectators like Nie Yinniang, in a cloud of free contemplation, a mood of wonder, of harmony, peace, and awe. When I participated in a round-table discussion of critics in Beverly Hills shortly before The Assassin opened in Los Angeles, Hou Hsiao-Hsien offered the following responses to questions posed. How did you approach re-creating the time period — the costumes, the sets, the props? It’s impossible to be a hundred percent accurate, or totally precise. I really wish I had a time machine to travel back and know exactly. Lots of research has been done. There is a very comprehensive historical reference book written in ancient China, as well as the Old Book of Tang and the New Book of Tang. All three gave us information about costumes, furniture, how artifacts were used. One striking discovery was the use of silk: it was worn then by farmers who manufactured it with silk worms. Did you pre-choreograph scenes just for this wuxia film? It wasn’t a disruption in my normal work flow. Our “action choreographer” really wasn’t one yet — he had a group of young stunt men who worked with him. Our two main actors weren’t martial arts actors. We broke up those scenes into bits and pieces: we took one, tried it, shot it; then later we took another and did the same. We spread this out over time. You cast both professional and lay actors in The Assassin. Can you give any examples of working with either group — whether you encountered any problems, and if not, any surprises? Regardless of the type of actor, I work with all of them in the same way. One method I don’t like is rehearsals. I never do them. I give the actors the situation, the context, and let them do their acting for the film. It’s “Lights, set up, actors!” The lay actors are mostly playing the servants, and they come from the theatre world in China. Some were the classmates of the crew members. There were lots of different types of situations for the actors, but I treat all of them the same way. In Three Times, your two actors play lovers, and here they have a history. How did you achieve that dynamic between the two actors? I didn’t do anything. I didn’t rehearse with them. They read the script and brought to it what they felt. I did have them read short stories and vignettes written in that era, about that era, and Japanese literature, too. The interesting thing is they had no questions for me. The cinematography is impressive, with the prologue in black and white and the narrative in color. It seemed as though you shot in digital. Where do you stand on digital versus 35mm film? Which do you see for the future of cinema? I shot on 35 mm for The Assassin, and then I scanned it and transferred it to digital. I’m thinking of digital for my next film, but I’m still a little worried about it. 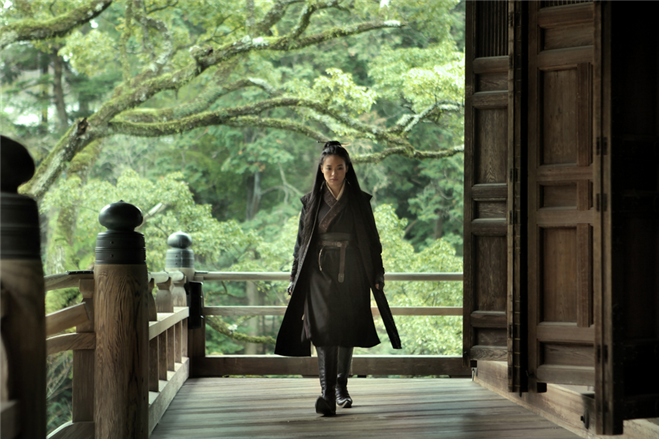 I shot 440,000 feet of film for The Assassin as opposed to an average of 10,000 feet for a film. Today film is becoming more and more expensive and is slowly disappearing, so digital is inevitable, but I’m basically a film person, and if The Assassin were shown on film, there would be even more layers to see. Cinema is really changing and evolving, even in terms of exhibition. We still have theaters today, but now we also have the Internet, so the language of film might change, because the Internet lets us play with film a lot. For example, comic books: some frames are big, some close up, some wide — so it’s possible for cinematic language to evolve like this. Does the “art house” exist in Asia as a concept of cinema? For me, art house cinema means personal filmmaking, not conventional or audience-friendly films. The auteur gets to figure out his own idea — what to express — and to propose a form. Digital cinema could take on a new language and actually improve personal filmmaking, by varying the size and shape of the frame, for example. Regarding the direction toward digitalization, it’s inevitable. The good thing is that more experimentation is possible. Filmmaking is becoming an increasingly individualized activity, like writing novels. That’s good, because this art could breed different, separate types of spectators instead of the tribal unity of viewing. There could also be different levels of content — light or deep, depending on the individual filmmaker. Traditional theater viewing could become extreme, luxurious, high-priced, with advanced high technology. Director: Hou Hsiao-Hsien; Producers: Hou Hsiao-Hsien, Chen Yiqi, Lam Peter, Lin Kufn, Gou Tai-Chiang, Tung Tzu-Hsien; Screenplay: Hou Hsiao-Hsien, Chu Tien-Wen, Hsieh Hai-Meng, Zhong Acheng; Cinematographer: Lee Ping Bing; Editors: Liao Ching-Sung, Huang Chih-Chia; Music: Lim Giong; Set/Costume Designer: Hwarng Wern-Ying; Sound Editor: Tu Duu-Chih. Cast: Shu Qi, Chang Chen, Zhou Yun, Tsumabuki Satoshi, Juan Ching-Tian, Hsieh Hsin-Ying, Sheu Fang Yi. Color, 35mm, 104 min. In Mandarin with English subtitles.